A double glitch on both sides ON FINAL ATTACK in war!!! Both sides in war were at last attack, both attacks freeze. Both lines are lost due to glitch. Then you give ap back after glitch, not according to your regeneration timer. 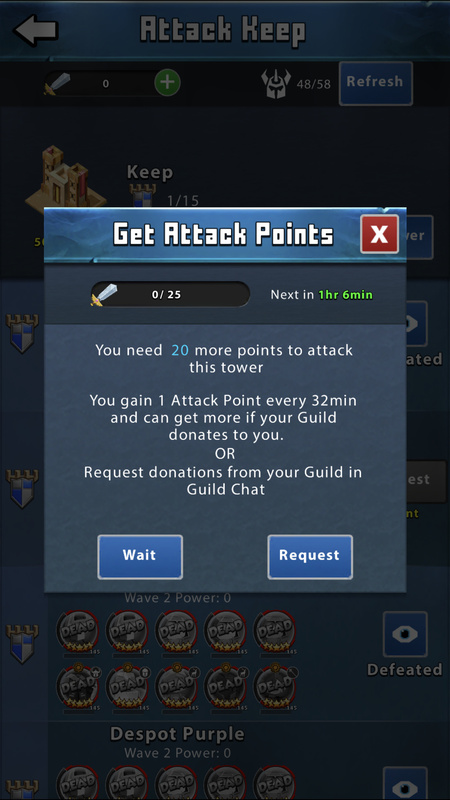 That cost us the war against top guild. Wasted a top player in our guild line. If anything the war should of been draw. Your AP regeneration timer was wrong. We worked very hard for a victory for a glitch to take that away from us. So you’re saying you and enemy got the same "glitch"
While you both were 1 attack from winning, and you both had the same glitch? Possible your teammate who attacked had a crash/freeze due to his phone and not the game? 1 line lost isn’t a lot, so his line is 10 times better than the rest of the guild lines? Context to the AP regeneration timer was wrong? Yes our Keep hitters are usually the most skilled and leveled players. And regeneration timer said 32 min which was false because it gain back before that. So because of the double glitch we lose. Ask antidote about double glitch they will tell you your moment of truth. Maybe you not understand me: final attack in Keep both sides, game glitches both sides, we lose strong line in glitch which was a definite win, opponent also loses the line they attacked with. So both sides have to wait for ap regeneration. Timer states 32min but gives back before that they make final attack we lose. The attacking player were AP capped, so you had to wait for him? Still everything that happend is so rare. Everything included the chances of everything is so small and legendary. During the double glitch our guy went into fight screen game freezes. Same for opponent. Both sides show under attack for a while. Then both sides lose lines they used. Then attacks are available again. But timer says 1hr and some minutes but states 32 min for regeneration. Regeneration happens in 5min for some odd reason they caught that before us and hit last line, so it’s several issues that happened. Were either AP capped or sleeping? They got AP after 5 min? if the SS from the guy who attacked or someone else?